Prior to the federal tobacco buy-out in October of 2004, Kentucky agriculture as a whole has not had a unifying focus or strategy to guide its future growth and development. Various organizations and agricultural sectors had established plans for their respective interests, but no plan existed for the industry as a whole. In the fall of 2006, Kentucky's Governor Ernie Fletcher secured the support of key agricultural leaders to address this need by developing a bold and broadly inclusive strategic plan. On March 15, 2007, over 450 Kentucky agriculture leaders attended the first Governor's Summit on Agriculture, where then-Governor Fletcher personally issued this challenge to the assembled leaders. The day-long event at the Kentucky Exposition Center featured nationally known business and economic experts, as well as representatives from all segments of Kentucky's agricultural industry. Governor Fletcher called on the Commonwealth's agricultural organizations, agribusiness and farmers to develop an action-oriented strategic plan which would build on Kentucky's agricultural strengths and propel all of Kentucky agriculture into the future. A major strategic intent of the new plan was to assess how the public views the agricultural sector, including their perspectives on the use of technology and on farm policy. Governor Fletcher emphasized the importance of securing strong public support for farm programs and for environmental and resource use issues important to agriculture's success. Finally, he encouraged the State's agriculture leaders to complete the plan before the Kentucky General Assembly's 2008 Legislative Session, in order for it to be timely and actionable. State Agriculture leaders including Commissioner of Agriculture Richie Farmer, Kentucky Farm Bureau President Marshall Coyle and University of Kentucky College of Agriculture Dean Scott Smith accepted the governor's challenge on behalf of Kentucky agriculture. Because of its broad representative base and its independent status, the Kentucky Agricultural Council (KAC) was asked to lead the plan's development. During the Governor's Summit, Dr. Tony Brannon, Dean of Agriculture at Murray State University and Chairperson of the Council, kicked off the initiative by presenting a project roadmap, including steps through which input would be obtained from all sectors of agriculture and agribusiness, and from the public at large. Over the next 45 days, agricultural organizations and entities across Kentucky nominated representatives, alternates and staff members to serve on the Council's Task Force. The Task Force met for the first time on May 2, 2007. Reflecting the sense of urgency that agricultural leaders brought to this initiative, a goal was set to complete the plan before the end of the year. Five additional Task Force meetings, as well as six Regional Public Forums held around the state to solicit and incorporate input to the plan drafted by the Task Force, were held from July through December. 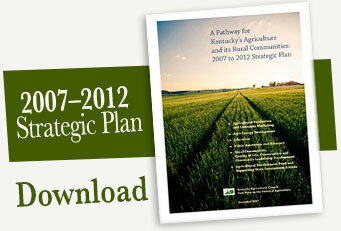 A Pathway for Kentucky's Agriculture and its Rural Communities, 2007 to 2012 Strategic Plan, was adopted in December 2007. On August 20, 2009, the Kentucky Agricultural Council released its first Progress Report, that tracks efforts made to implement A Pathway for Kentucky Agriculture and its Rural Communities: 2007 to 2012 Strategic Plan. The Progress Report was presented to representatives of the Executive and Legislative branches of Kentucky government, as well as to the agriculture community at large.